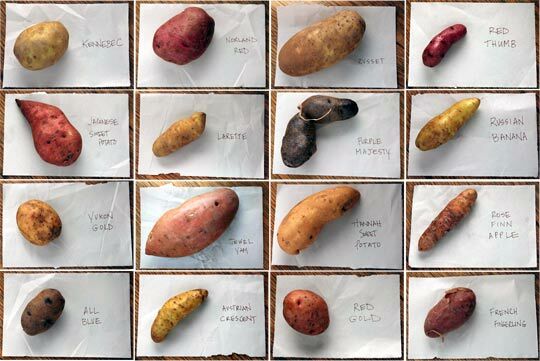 The versatile potato comes in many colors. Layer potatoes, ham, and onion/cheese in a glass baking pan. Dot with butter and sprinkle with salt and pepper. Cover loosely with tin foil and bake in a medium (325°-350°) oven for approximately an hour. Potatoes come in many colors and varieties, but potatoes fall into three basic categories:starchy, waxy, and those in-between which are referred to as all-purpose. Cooking methods are different for each type. Starchy potatoes are great for baking and frying. Because of their starch, they don't hold together very well when cooked, but they are are fluffy and absorbent, perfect for butter on a baked potato or the oil in a fryer. They are decent mashed, but care must be taken not to over work them, else you'll have a gluey mess. Waxy potatoes have a smoother, more waxy texture so they hold their shape while cooking. They work well in dishes like soups, stews, potato salad and scalloped potatoes where you would need to boil, slice, or roast. All-purpose potatoes have a less starch than starchy potatoes, but not so much that they completely fall apart when cooked. They will work for most potato dishes. For safety, avoid potatoes with a green-tint to the skin. These have been exposed to too much light and have developed the toxin 'solanine' which can cause some nasty conditions like cramping, headaches, diarrhea, and fever. Such a potato also will have a bitter flavor. 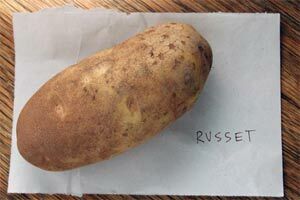 Russet (starchy) This is the potato most people have fixed in their minds as the classic potato. They are ideal baking potatoes and are also good fried and mashed. 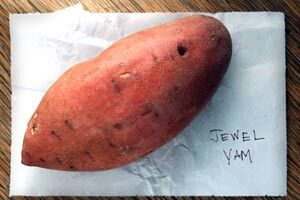 Jewel Yam (starchy) Actually a sweet potato, not a true jam, this is the most commonly found market sweet potato. Great baked or roasted. 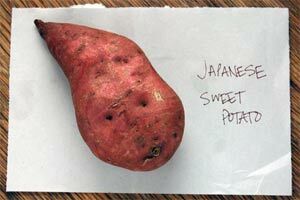 Japanese Sweet Potato (starchy) This variety has a pink to purple skin with white flesh. Its flavor is sweet and nutty. They can be grilled, steamed or baked. 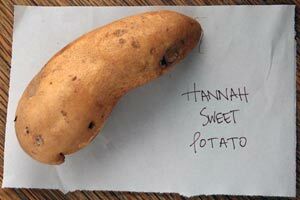 Hannah Sweet Potato (starchy) Very much like a Jewel potato, but with lighter skin and flesh. 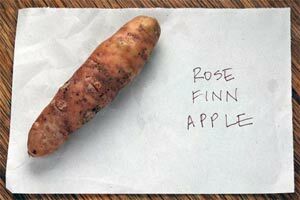 Rose Finn Apple(waxy) This is an heirloom fingerling with a pink, often knobby skin with golden buttery yellow flesh. It has an earthy flavor and is great boiled, grilled, sauteed, deep fried, and served in salads. 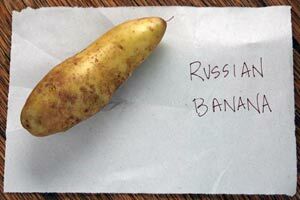 Russian Banana (waxy) This potato has a pale yellow skin with rich yellow flesh and a firm texture. It is good grilled, sautéed, fried, roasted whole or steamed for potato salads. 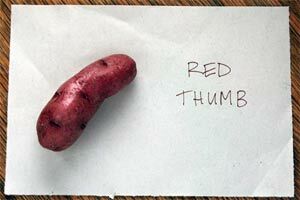 Red Thumb (waxy) Fingerling with a bright red skin and pink flesh. Best boiled or roasted. A favorite among chefs. 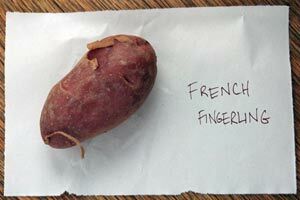 French Fingerling (waxy) Pink skins and yellow flesh. This heirloom fingerling has smooth skin and yellow flesh. There is usually a little pinkish ring right under the skin. It is a great potato for roasting. 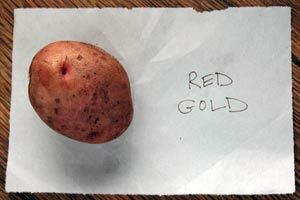 Red Gold (all-purpose) These are medium sized tan and red skinned potatoes with golden flesh. The texture is smooth and moist and the flavor is sweet and nutty. They are best baked, boiled, roasted or mashed gently. 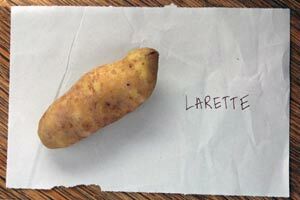 LaRette (waxy) These are little fingerling-shaped potatoes with a silky texture and a nutty flavor. Best roasted or boiled whole. They were discovered in the Swiss Alps by French Farmer named Jean Pierre Clot. 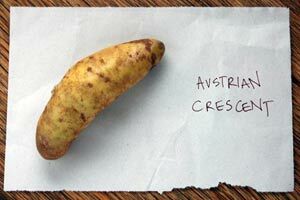 Austrian Crescent (waxy) This is an heirloom variety with yellowish, tan smooth skin and very light yellow flesh. It is best in potato salads, but also great boiled, steamed and roasted. 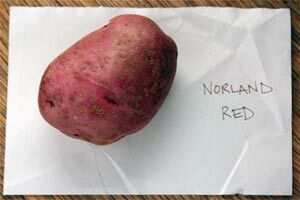 Norland Red (all-purpose) Red skin and moist, creamy white flesh that holds up well when cooked. The farmer suggested serving them boiled, sliced and topped with butter and herbs. Can be boiled for potato salads as well as roasted, mashed, baked. Great boiled for potato salad, or whizzed into a soup. 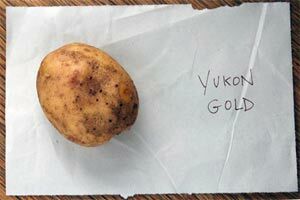 Yukon Gold (all-purpose) Golden inside, rough brown skin. Great mashed, boiled for salads, fried... you name it. 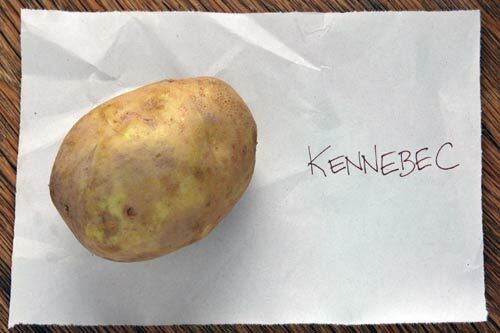 Kennebec (all-purpose) This is a large potato with tan skin and white flesh. Baked, mashed, fried, or shredded into potato pancakes. It holds together well in boiling water as well. 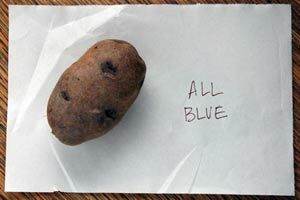 All Blue (all-purpose) This potato is truly blue both inside and out. It has a dry texture, but holds its shape well, so it's best baked and drizzled with butter or olive oil, or boiled/steamed for a potato salad. Steaming and baking will ensure it keeps its color best. 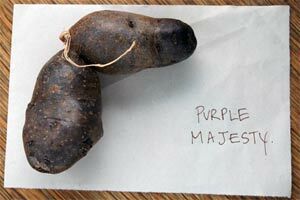 Purple Majesty (all-purpose) Oblong potatoes with very dark purple skin and purple moist, firm flesh. It keeps its color when cooked and is high in antioxidants. They are best roasted, baked, in soups and mixed into potato salads.